I’m a native of Peoria, IL. I enjoyed growing up in the theater community made famous during vaudeville days: "will it play in Peoria?" During my life, I have been involved in a great deal of theater and singing as well as being a biologist. Eventually, I progressed to writing short scripts for the stage and full-length scripts for radio theater. Several of the radio scripts were produced in NJ and NY by various theater companies and one has been recorded and released. The greatest inspirations for my writing are my iguanas, my personal pets and the iguanas who passed through my iguana rescue in NJ. I am currently writing children’s stories as well as murder mysteries. 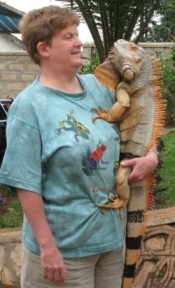 So many stories, so little time.I live with my iguanas (4 species), tortoises, tegus, and turtle. Please contact me if you have questions or comments about my books, or if you want to talk about iguanas, lizards, or turtles! Arthur F. Winstanley was born in Brooklyn, New York. He served in the Army during the Korean War from 1950 to 1953, receiving the Bronze Star Medal as well as other medals; he was discharged as a First Lieutenant. He earned his Bachelors of Fine Arts at Cooper Union in New York and his Masters of Fine Arts at Syracuse University, New York. He was employed by AT& T, Berkley Heights, NJ, as an Art Director for their Engineer Magazine. Arthur was also a Boy Scout Leader for many years and after retirement from AT&T, worked as a tour guide for the Red Mill in Clinton, NJ. He also was involved in several community theatre companies. He had the privilege, saying it was great fun, to do the illustrations for “Curtis Curly-tail”. He is survived by his wife, Kate, brother, John, 4 daughters, three sons, 18 grandchildren and 6 great grandchildren. Nicholas Thorpe is a Illustrator with a BFA in Animation. He's a Tucson native meandering the hills of the Pacific Northwest. He hunts for elusive house hippos in his spare time.